Atatürk International Airport (formerly Yesilkoy International Airport) is the major international airport in Turkey. It is in the European part of Istanbul. In 2010, about 32 million passengers used Atatürk Airport. It was the 8th busiest airport in Europe in 2010. The airport has three terminals – Terminal 1 for international passengers, 2 for domestic passengers, and 3 for cargo. 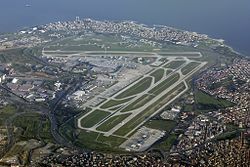 Atatürk Airport has three runways - runways 3000x45m (17L/35R & 17R/35L) and runway 2600x60m (05/23). To get to the city center from Istanbul Atatürk Airport (IST), there is a light rail service, airport shuttle service, municipal buses, taxi, or hire cars. This page was last changed on 30 August 2017, at 21:16.